Morisi Kvitelashvili of Georgia performs his Free Skate at 2018 Skate America. 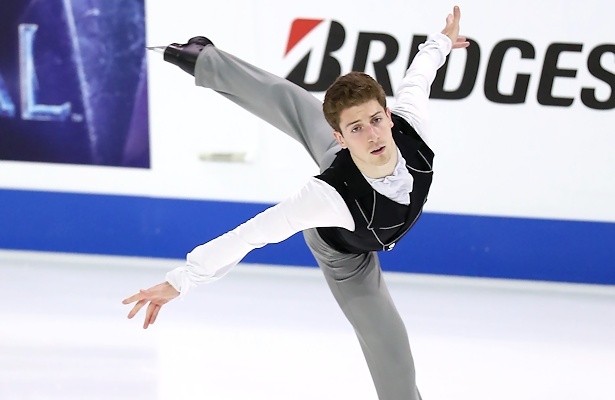 Morisi Kvitelashvili of Georgia skated right into figure skating history when he earned the silver medal at the 2018 ISU Grand Prix of Figure Skating event Rostelecom Cup in Moscow last November, becoming the first Georgian to win a medal on the senior-level Grand Prix circuit. He delivered two solid performances and skated much better than at his first Grand Prix Skate America, where he came in eighth. Overall, Kvitelashvili sees progress in his skating this season after finishing fourth at Nepela Trophy and third at Finlandia Trophy before the Grand Prix Series. The Muscovite went on to win the Bosphorus Cup in Istanbul, which was a smaller competition. Kvitelashvili was born and raised in Russia as the son of Georgian immigrants and skated for Russia until the end of 2015 before deciding to represent his “historical home country” as he puts it. He has been training under Eteri Tutberidze and her team for a year and has shown a lot of promise, but often lacked consistency. Improving his consistency is something the 2018 Olympian has worked on a lot. Following the Bosphorus Cup at the end of November, Kvitelashvili started focusing on his preparation for the ISU European Figure Skating Championships this month. There was only a short break for the Georgian over the New Year holidays which he spent with his family. The skater knows that clean programs have become more important with the introduction of the broader range of Grade of Execution (GOE) from -5 to +5 and feels that taking risks with quads is not rewarded anymore. The Rostelecom Cup silver medalist has the quad Salchow and toe in his repertoire. He tried the quad flip, but it is not ready yet for competition and he feels it is because of problems with his technique. Kvitelashvili trains with the Russian “quad queens,” Alexandra Trusova and Anna Shcherbakova, who have landed the quad Lutz in competition, and he is impressed by them. In this season’s programs, Kvitelashvili is portraying an artist. The Short Program is set to “Bloodstream” by Tokio Myers, a combination of classical and modern music, and the skater is portraying a writer that is full of ideas. In the Free Skating to music from Mozart, l’opéra rock, he takes the role of composer and musician Wolfgang Amadeus Mozart.